The Vazimba were / are the legendary first inhabitants of Madagascar. Oral history classifies them according to the parts of the island where they presumably settled. Vazimba andrano ("Vazimba of the Water") settled along lakes & rivers. Vazimba antety ("… of the Soil"), believed the most numerous, reportedly clustered around the valley of Betsiriry in the central Highlands. V. antsingy ("…. of the Tsingy") lived in the caves around the limestone formations (tsingy) of Bemaraha in western Madagascar & probably scavenged fruits & other forest produce. Cacáo arrived on Madagascar mostly in the ships of later French colonists. This bar carries both a primal & civil character that, had it been it been among the island's pre-historic bounty, would no doubt have constituted a healthy & famous part of all Vazimba diets. Among the most inviting unsweeteneds yet. Utter restraint & consideration for the end user. A diametric twin to Pralus Le 100 from the same origin. That just blares the upper reaches where this inhabits the lower realms. The souring sniffed in the Aromatics fails to translate -- & just as well. Ditto cocoa essence -- latent or else -- TBE of Madagascar which rarely carries heavy chocolate thunder. Instead, a streaming vegetal download. Sourced from Menakao's stock & in all likelihood a secondary season harvest missing the captivating acidity that put Madagascar cacáo on the map. 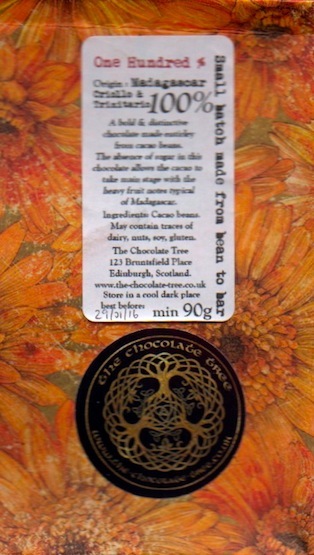 Which comes as a disappointment to the The Chocolate Tree's Ali Gower. Realizing thus, he & his fellow barsmiths spec'd this allotment closely. Roasted (semi-warm 135ºC / 275ºF) & refined (extensive conching) to the nth degree on very basic, restricting equipment. In the process Ali underestimates the accomplishment here. For the 100 Class, this actually triggers that all-too-rare enjoyment rather than the usual unsweetened, grimacing test-of-endurance. A 100 on which the tongue 'n throat never feel the urge to spit / bail but rather stay on it, happily, to the all-too-soon terminus. Nary an off-note, nor a false one. Every taste-point conveys edible organics as opposed to the vast majority of these Bruts marked by dirt & battery acid.